The real potential for Twitter #Music has always been the idea of combining a robust music player app with the real-time trends and discussions of its social network. 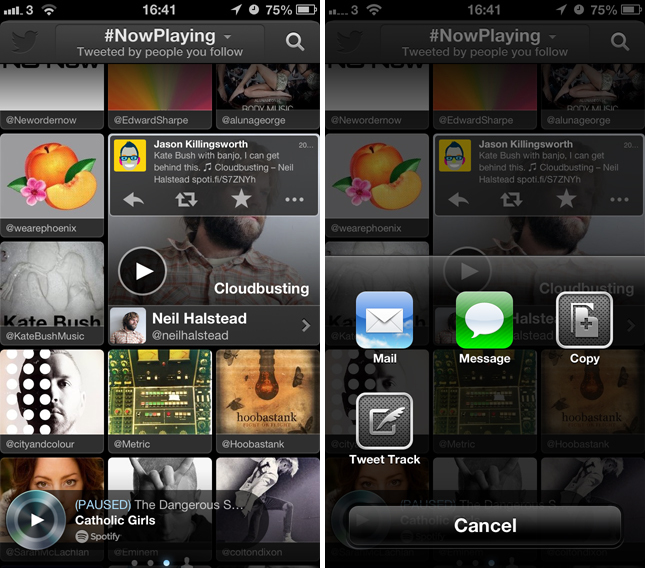 To that end, the #NowPlaying feed in the iOS app has been updated today to show the tweets tied to each track. When you select a song to listen to, the thumbnail will now expand and identify the user in your following list that originally tweeted about the song. Reading the original tweet is a useful way of knowing why it’s emerged in your #NowPlaying feed, but it also gives you the option to reply, retweet and favorite their message. Furthermore, hitting the ellipsis icon brings up a basic share menu, either for tweeting about the track yourself or sending it to some else via email or text message. It’s a small improvement, but one that should bring forward the oftentimes forgotten social elements of Twitter #Music.